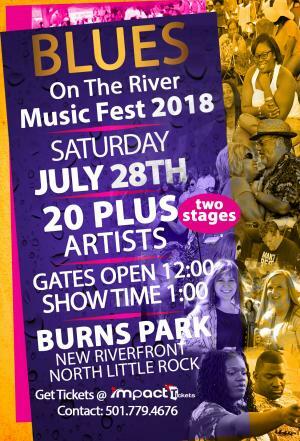 Tickets for Blues On The River Music Fest 2018 in North Little Rock from Impact Tickets, LLC. ACCORDING TO THE PROMOTER: DO TO WEATHER CONDITIONS, SHOW IS RESCHEDULED TO A LATER DATE AND ALL TICKETS WILL BE HONORED! Please contact Promoter for further details. 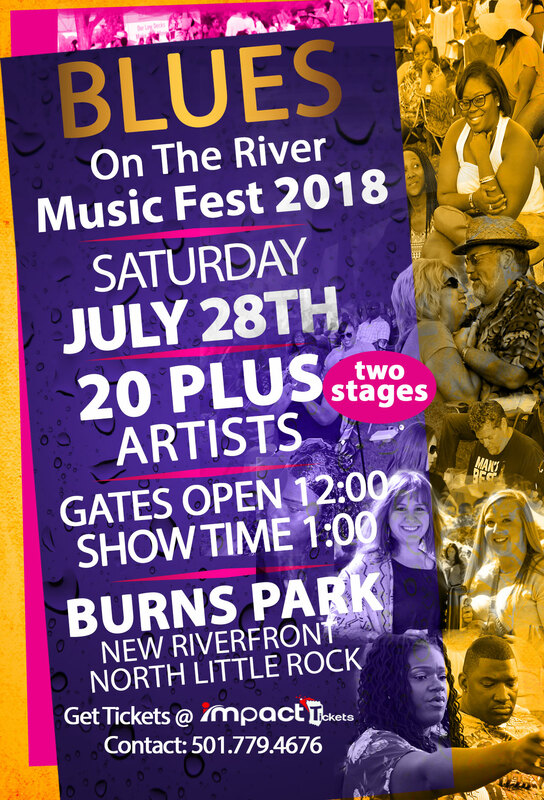 It's the 19th Annual 2018 version of BLUES ON THE RIVER MUSIC FEST! We're turning it up with more than 20 acts and two stages. Doors open at 12:00 Noon and Showtime is 1:00 PM. It's a family-friendly festival with senior and handicap accessibility. RV and boat dock view of the event, Park Pavlovian. Rental, courtesy shuttle service, charter bus parking, cool down area and shaded, secure environment, special group rates available. Coolers are allowed in the park but not inside the event...Lawn chairs only and small tents (10x10) setup applies. Tents only allowed in the tent area, only inside of event gated area, tents cannot block the view of the audience. There will be a $10 re-entry fee. .No outside food or drinks allowed in the event area. General parking on site is $10.00, VIP parking is $20.00, Boat Docking view $25.00, and RV parking ONLY is $50.00, there are no connections. NOTE: ARTIST AND TIME ARE SUBJECT TO CHANGE! ARTISTS ARE SUBJECT TO CHANGE!!! Food vendor $700.00 -Food only. No beverages sales. This is strictly enforced. Bikes entered will be judged by BEST CRUISER and BEST STREET bike. NOTE: ALL BIKERS MUST REGISTER RIGHT HERE ON IMPACTTICKETS.COM BY 4:00 PM JULY 28TH. SHOW STARTS AT 5:00 PM. Prizes: Trophies will be issued for 1st, 2nd, and 3rd place in each category. THE SHOW WILL GO ON RAIN OR SHINE!!! SECURE YOUR TICKETS! TICKETS CAN ONLY BE SCANNED ONCE!